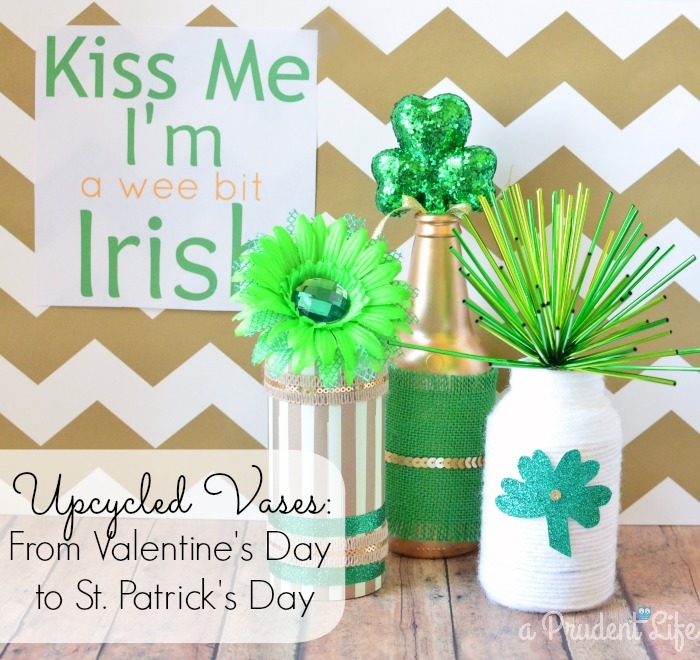 I was looking at the Upcycled Vases I made and realized they could easily be transitioned right into St. Patrick’s Day with just a few easy & cheap tweaks. Any excuse to keep some extra gold decor out a few weeks longer! For my holiday swap, I purchased some green picks from Hobby Lobby ($1-$1.50 each). I also picked up a sparkly green fabric for $1.50. Total investment in the transformation was $6. Not bad for a whole vignette! I didn’t have a real solid plan for what each vase should look like, so I also gathered up a few extra green & gold ribbons I had on hand (from Michael’s awesome Christmas clearance) to see what worked. First step was figuring out which pick looked best in each vase. I settled on this combo. Next, I got a bit delusional about my abilities. It turns out that becoming a blogger does NOT magically improve your drawing ability. You know how when you don’t feel well, simple tasks seem difficult? That was the cause of this next photo. The thought of going ALL the way down the hall to get the laptop so I could cut out a four-leaf clover on the Silhouette sounded like too much work. 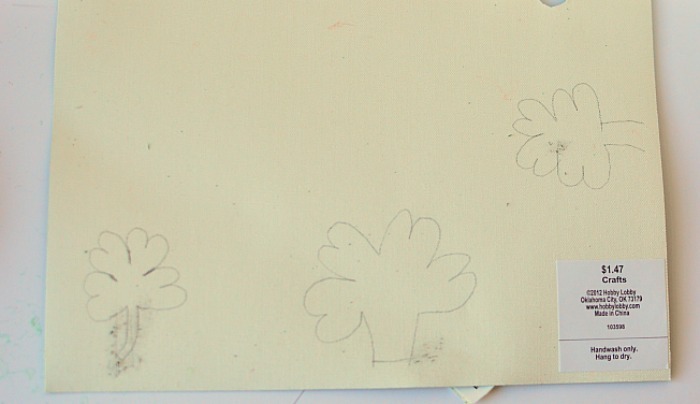 And I thought, hmm, I freehand cut out the heart for the yarn vase, I’ll just drawer a clover and cut it out. Ha. I know I can’t draw. I feel compelled to share my sketches so you can all get a chuckle. I mean, what is that middle thing? A mushroom clover hybrid? A Venus flytrap? My FOURTH try wasn’t AS bad as the others, so I decided to cut it out and see what happened. I couldn’t really decide if I loved it or not. Against my better judgment I super-glued it on the yarn vase. Then I had more doubts. I went to my friend Google to search for clip art four-leaf clovers, still not sure if mine was good enough. Turns out, there are a lot of ugly clovers out there! I ended up keeping the one I drew and adding a little gold circle to center. The gold heart is still on the other side of the vase. Now it’s reversible! To finish the other two vases, I just added some ribbon. 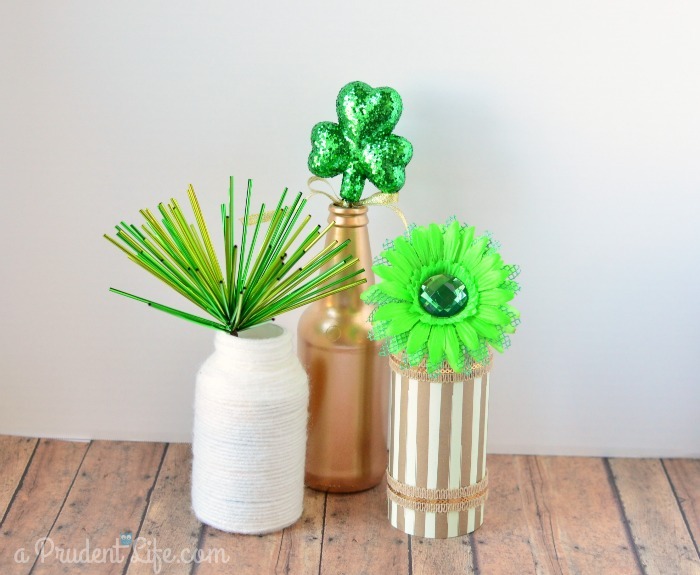 The striped vase got two rows of green sparkle ribbon. 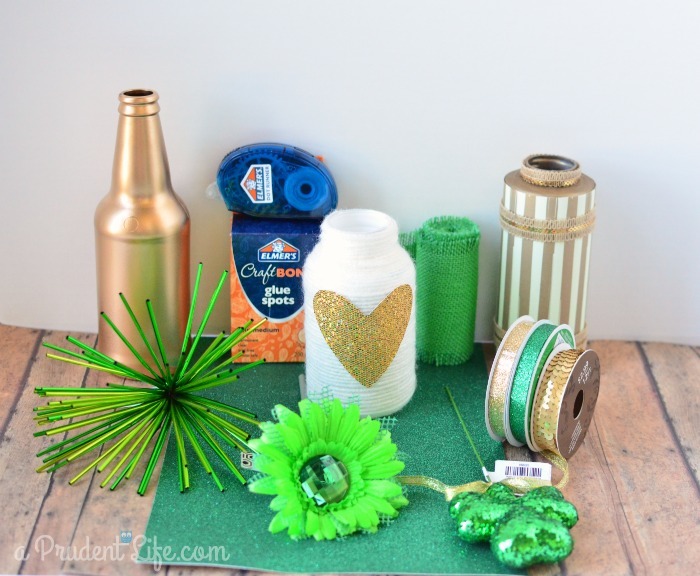 The gold vase got green burlap & a row of gold sequins. For both of those vases, I was careful to attach the ribbon to itself & not to the bottle. It’s just tight enough to stay in place. I should be able to slide it right off when it’s time to use the vases for Valentine’s Day next year! 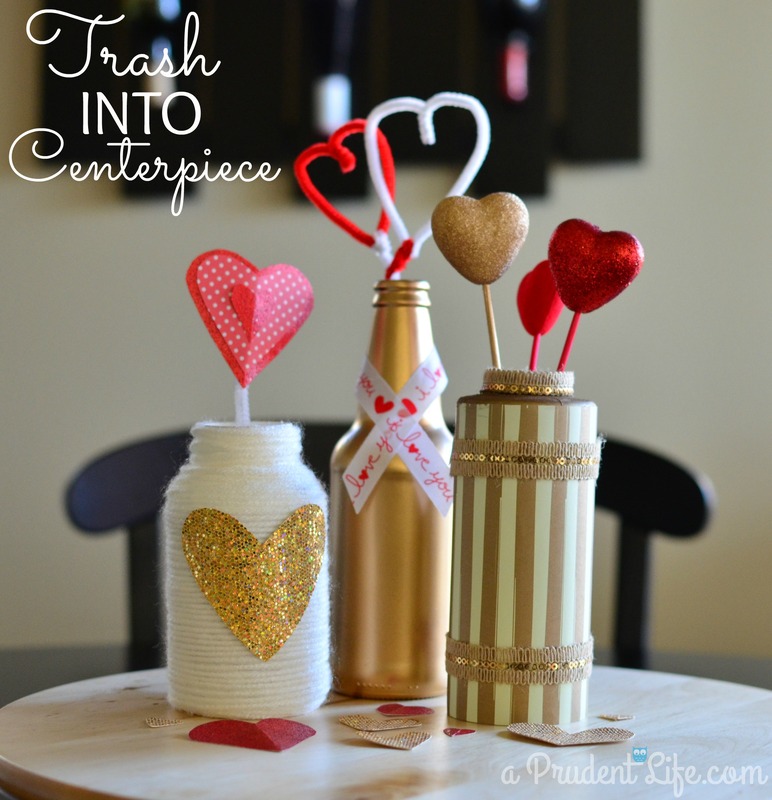 Simple, fast, frugal AND cute! The whole trio is a little wilder than our normal decor, but I love it anyways. Love these, Melissa!! I think I like them even better than the Valentine ones, and I LOVED those! Thanks for sharing at DIY Sunday Showcase!! You’re so sweet Katie! Thank you! These look so cute. I love the colors and design. Very clever! Thanks for sharing this on DIY SUnday Showcase! What a great idea, Melissa! Thank you for sharing this at DIY Showcase on VMG206. 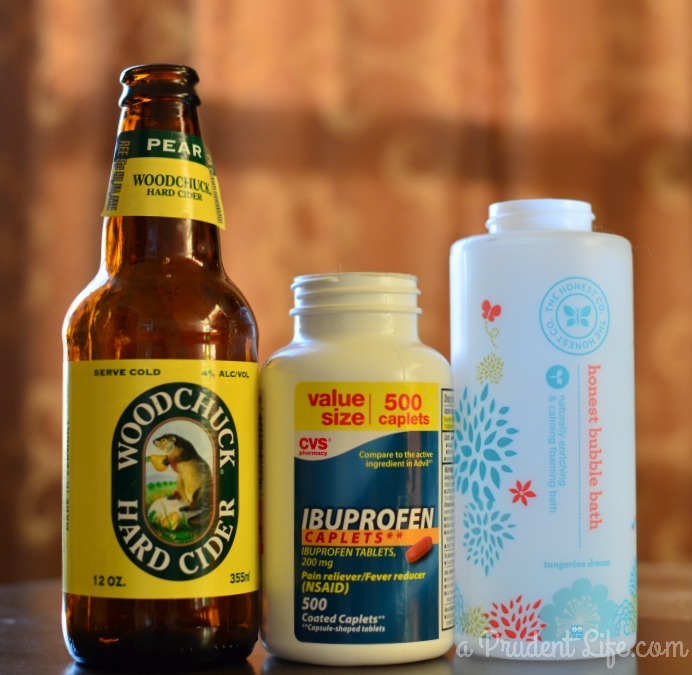 I’m featuring your post today in my 10 St. Patrick’s Day Ideas Round Up! Wow, thank you Megin! I appreciate it!